Swimming-pools are the ultimate wet areas when it comes to tile fixing. 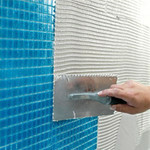 The tile adhesive needs to have strong bonding and be flexible. The tile grout needs to be resistant to different kinds of aggressions and chemical attacks. Tiles in permanent water immersion are submitted to water pressures or to counter-pressurse when the pool is empty. Thus, the tile adhesive needs to be water-resistant and flexible enough to ensure the good adhesion of tiles in all cases. The chlorine and detergents used in pools will directly impact the durability of tile grouts. The choice of an appropriated chemical-resistant grout is important to build a long-lasting swimming pool. • The grout on the pool sides at the edge of the waterline may be exposed to greater erosion as a result of the water movement there. • Pool surroundings may undergo stringent and frequent cleaning regimes. • Walls in rooms adjacent to the swimming pool will be exposed to constant high humidity and need to have good water resistance. Ensure that the surface is clean, sound, free from dust, molds, grease, and laitance using high water pressure jet. Check the cohesion of the substrate, and using a hammer eliminate hollow and loose parts. Use weberep 331 TX to repair the hollowed concrete surface (repair from 5 to 50 mm) or any other repair material from Sodamco-Weber range. Apply a flexible cementitious waterproofing membrane weberdry 110FX before tiling. Apply the first coat of this 2-components product (powder+resin), then embed Plastic Mesh F15 in the first layer and apply a second layer of weberdry 110FX. Allow drying before beginning the tiling job. It is important to select an adhesive with the appropriate level of flexibility to accommodate for the expected strains from either differences in thermal or water movement and/or deflection of the substrate under load. 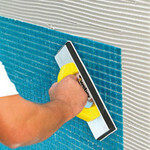 You may webercol flex to fix tiles in private and public swimming pools. Webercol max, webercol premium, webercol fast, webercol F1, webercol plus and webercol flex can be used to fix tiles in private swimming pools less than 80 m³ (if ceramic tiles are used, not mosaics). Apply the tiles over the tile adhesive and press them firmly. Grouting should be done at least 24 hours after fixing tiles, using weberjoint perfect in private swimming pools. For public swimming pools, it is recommended to use an epoxy based grout such as weberepox easy. Allow at least 10 days after grouting before filling the pool.